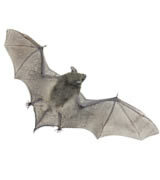 While bats may be great for our environment, having them in your home is anything but pleasant. Not only do their droppings cause damage; they make noise from inside your walls and carry harmful diseases such as rabies and histoplasmosis. If you’re looking for the best source of bat removal, then Critter Control® of Miami has the tools, knowledge, and expertise to get things done properly. It is important identify the proper species of bat when determining the appropriate removal technique. Different species of bats have different reproducing and hibernating seasons and understanding their habits will lead to a more efficient removal process. At Critter Control® of Miami, we back our comprehensive services with a three-year quality guarantee. Our commitment to quality and superior work has earned us an A+ rating with the Better Business Bureau and an Angie’s List Super Service Award. We even offer 24-hour emergency service. Contact us today at 305-964-8683 to schedule your free home inspection.